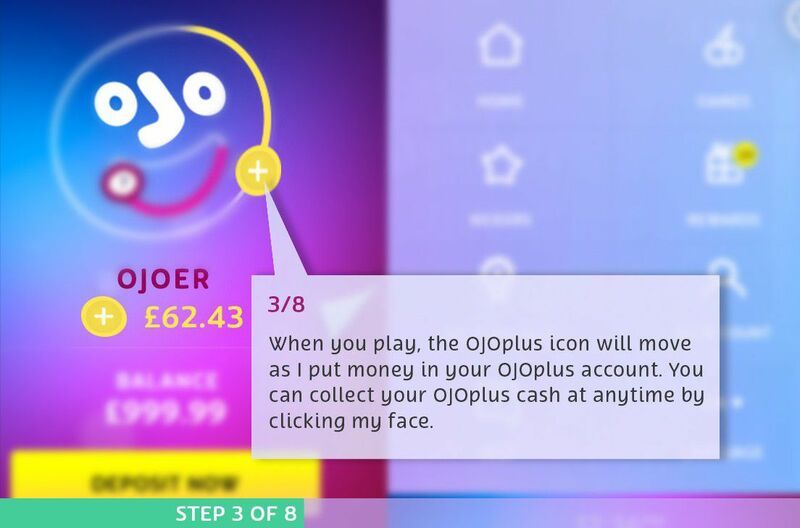 When you play, the OJOplus icon will move as I put money in your OJOplus account. 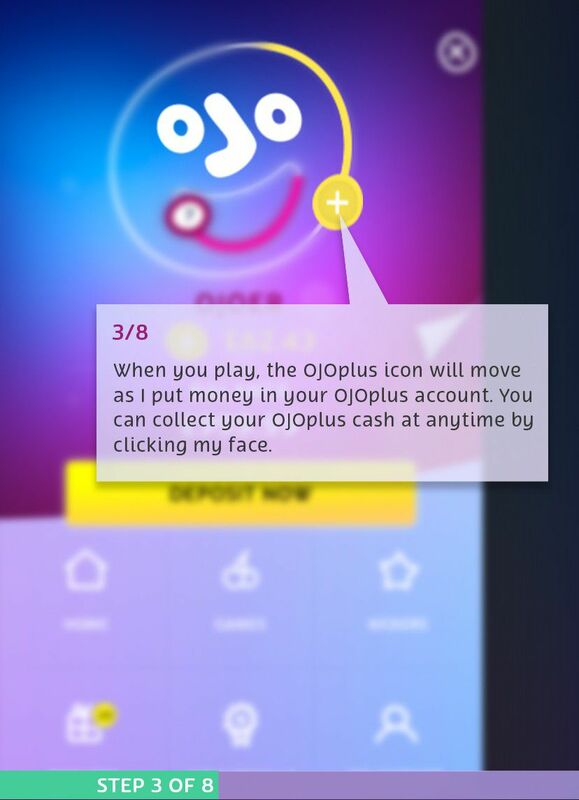 You can collect your OJOplus cash at any time by clicking my face. As soon as you start playing you’ll work towards unlocking new levels, as you move up through the levels I’ll sort you out more perks. No need to thank me! 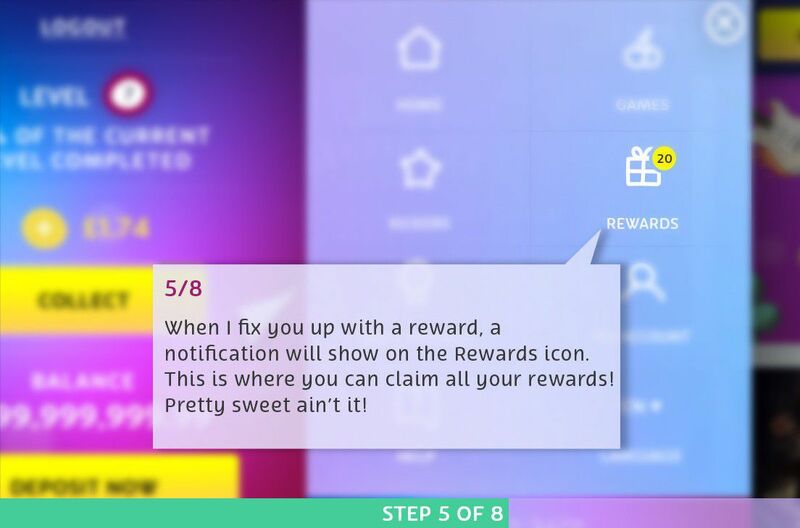 When I fix you up with a reward, a notification will show on the Rewards icon. This is where you can claim all your rewards! Pretty sweet ain’t it! 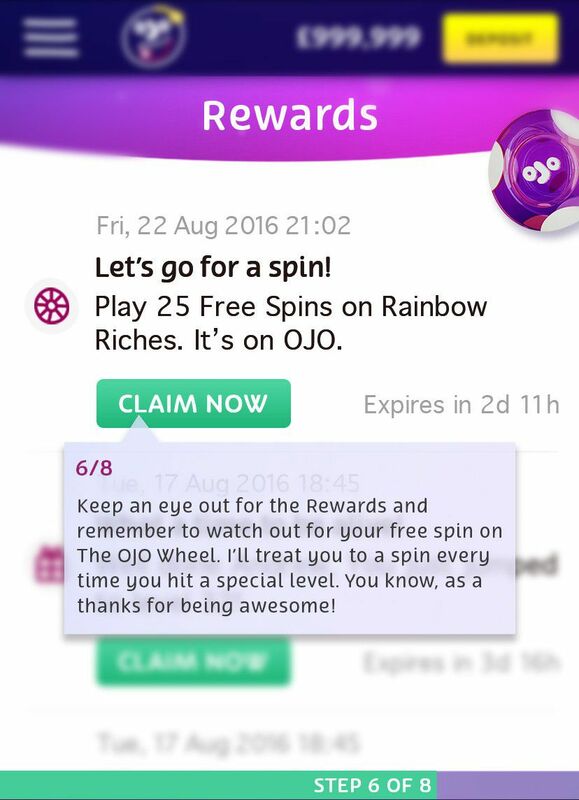 Keep an eye out for the Rewards and remember to watch out for your free spin on The OJO Wheel. I’ll treat you to a spin every time you hit a special level. You know, as thanks for being awesome! This is where I spoil you with Free Spins. Each has a different level of risk and reward. 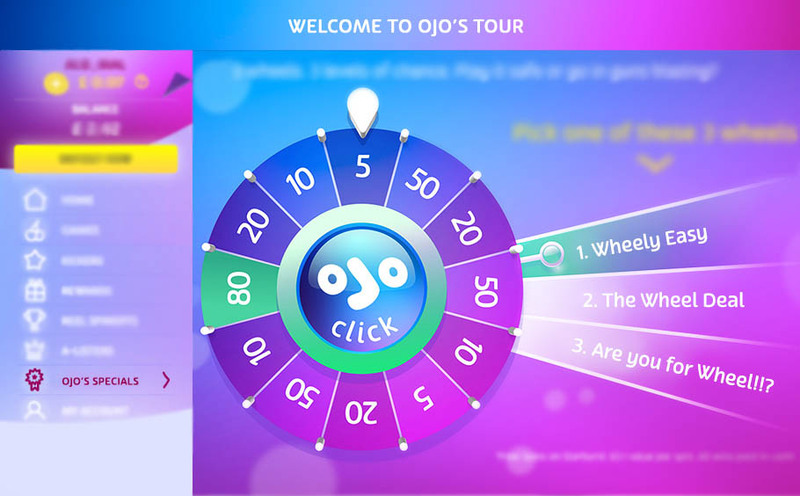 Pick your wheel and hit the OJO button to spin it. Oh, and all wins are paid in cash! Ker-Ching! Which game providers does OJO work with? Does OJO have a Loyalty System? How does OJO reward A-list OJOers? Where can I view my OJOplus balance? When can I withdraw my OJOplus cash? What are the OJOplus categories? What deposit methods does OJO offer? I’ve requested a withdrawal. Do I need to ping over any documentation? How loooong will it take to get my withdrawal? How can I make quick deposits? Does OJO have minimum deposit and withdrawal requirements? Can I withdraw to a different payment method than I deposited on? Why has my deposit declined? Noooo! What is a Deposit Confirmation Form? Does OJO have wagering requirements? How do I know if I have a gaming problem? I think I have a gaming problem? What should I do? How do I set a Cooling-Off period? How do I set a Temporary Suspension period? How do I set a Self-Exclusion period? My Self-Exclusion period is over, how do I re-open my OJO account? Can I set Deposit Limits on OJO? What is OJO's Reality Check? Where can I see my Kickers? How do I claim my Kicker? Gimme! How do I claim my Deposit Kicker? My Kicker Code didn’t work…what's the deal!? What's the difference between the 3 OJO Wheels? What are OJO's Reel Spinoffs? Where can I find OJO's Reel Spinoffs? How do I enter Freeroll Reel Spinoffs? How do I enter Buy-in Reel Spinoffs? How do I know if I've won anything on OJO's Reel Spinoffs? How do I rate OJO's great games? Is OJO a safe place to play? How safe are my personal details with OJO? What gaming license does OJO hold? How do I verify my OJO account? OOPS! I forgot my p@5sw0rd. How do I get a new one? The game is not loading…97%... What do I do!!? My game is stuck and I can't play…!? Why am I not receiving OJO's emails? 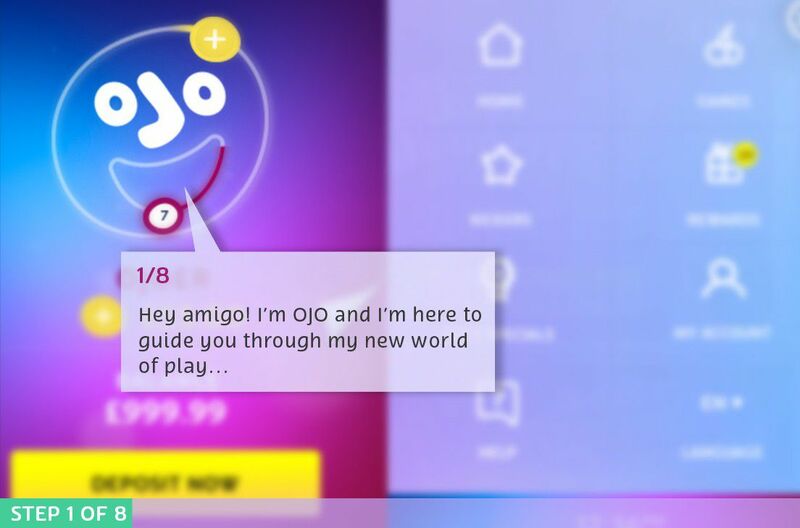 OJO is your sidekick in a new world of play. He shows you everything you need to know for a more playful and rewarding experience. OJO is there to inspire you to be more playful. He's here to share the secrets of this world - he knows how things work and will give you hints and tips on how to get the best from your time here. OJO believes in rewarding those who deserve to be rewarded. It’s important that OJOers abide by OJO’s fair play rules, and don’t abuse OJO’s generosity. Any promotional abuse will not be tolerated in OJO’s world of play. 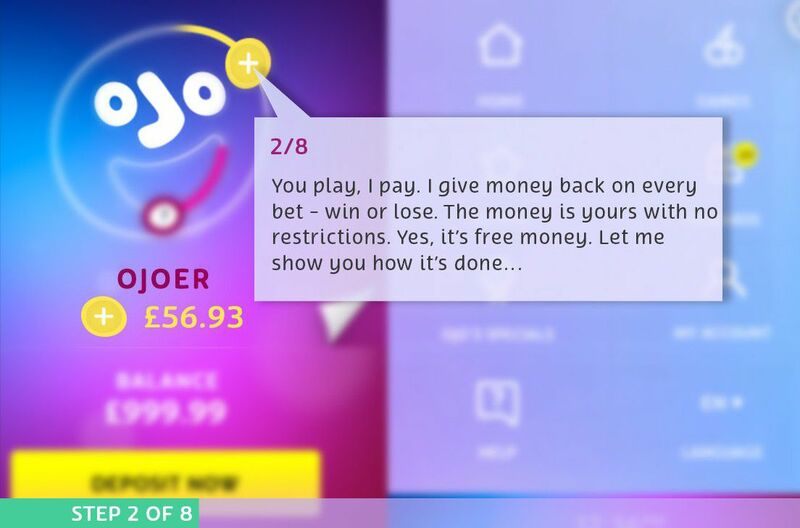 You can check out OJO's Reward and Game Play Policy here. Keep it fair. Keep it OJO! 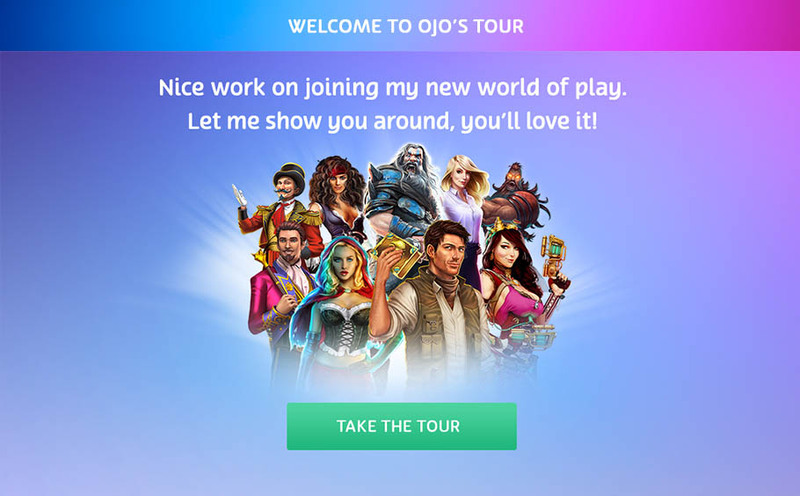 OJO has teamed up with the BIGGEST and BEST gaming providers, so you'll get to enjoy the most popular plays on the web. OJO works with NetEnt, Microgaming, AMAYA, Barcrest, NextGen Gaming, MERKUR, blueprint GAMING, WMS and SkillOnNet. 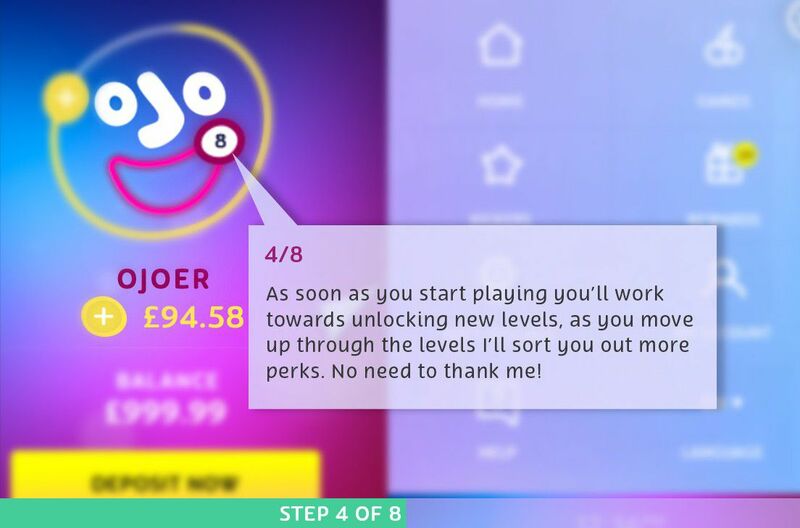 How does OJO's Loyalty Levels work? Every time you play, you'll move closer to the next level. 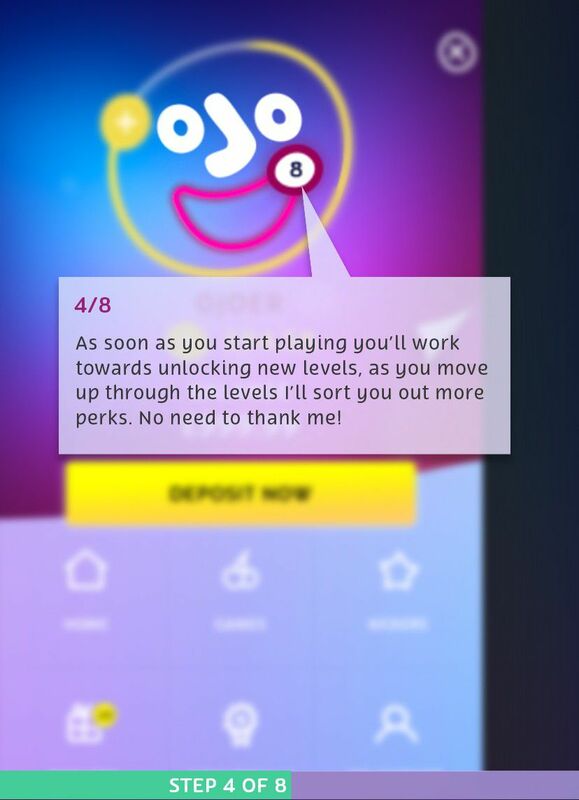 You can view your level progress on OJO's gorgeous smile, here you can see what level you're on and how long you've got until you reach the next level. 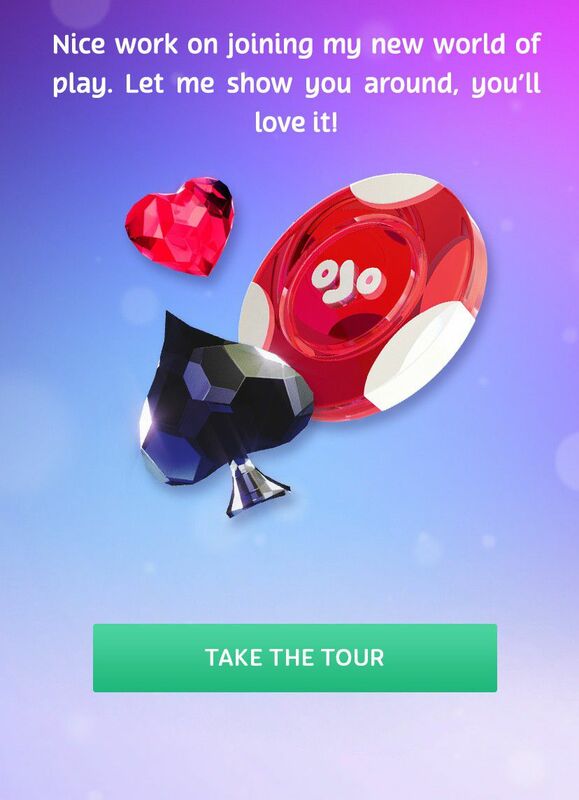 Every time you go up a level you'll get more rewards, and you might even be treated to a spin on The OJO Wheel where you can win some serious prizes! The cherry on the cake? You can never go down levels, you can only move up! The chosen OJOers will receive a private invitation to join Club OJO. OJO will assign one of the A-list Managers to look after you, so you'll get the royal-OJO treatment and heaps of treats. Your A-list Manager will tailor special offers for you and you'll even get gifts on your birthday, just because…it's you! 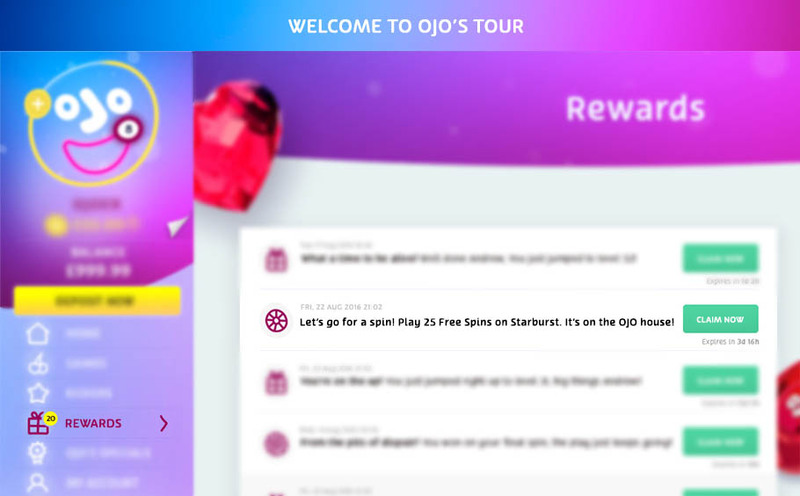 The Rewards section is where you can check and keep track of all the rewards OJO has given you. Got a spin on the OJO Wheel? Check Rewards! Got some Free Spins? Check Rewards! Got a Tournament ticket? Check Rewards! 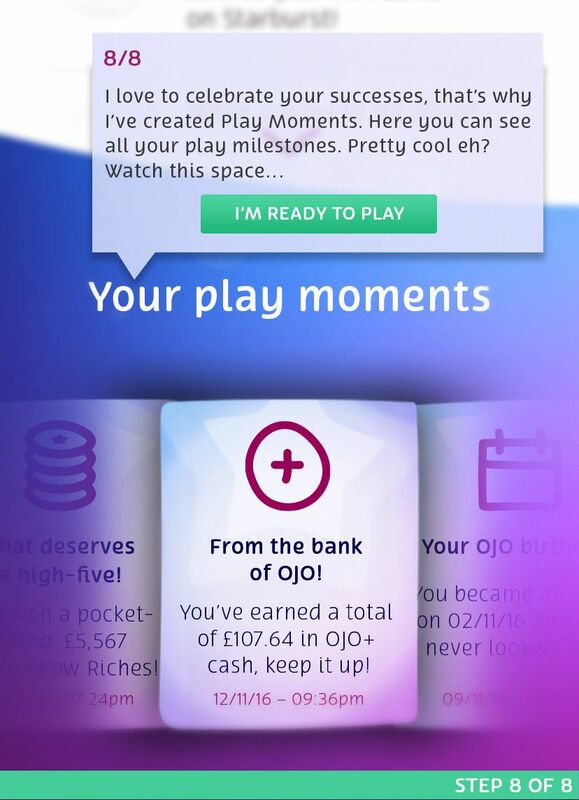 Play Moments are a great way to remember all the good times you've had with OJO. 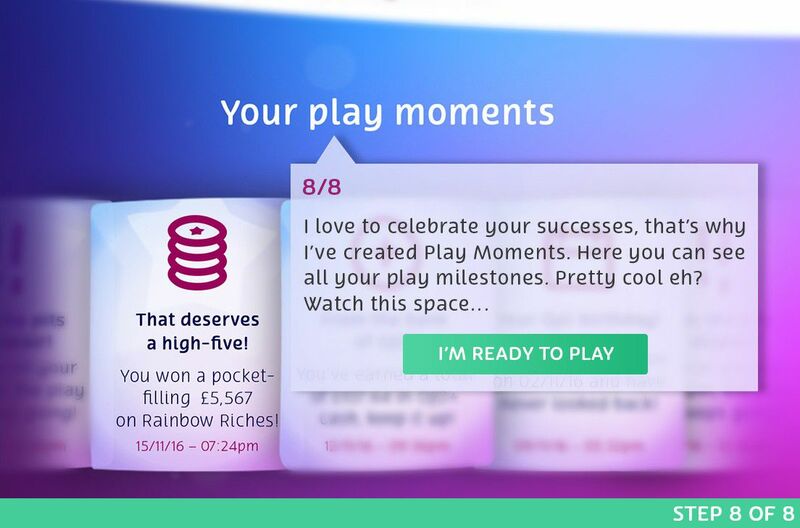 Here you can see all your play activity, if you've jumped to the next level, hit a big win or played a new game, then it will pop up in your Play Moments. You can even see the day you became an OJOer. It's simple. 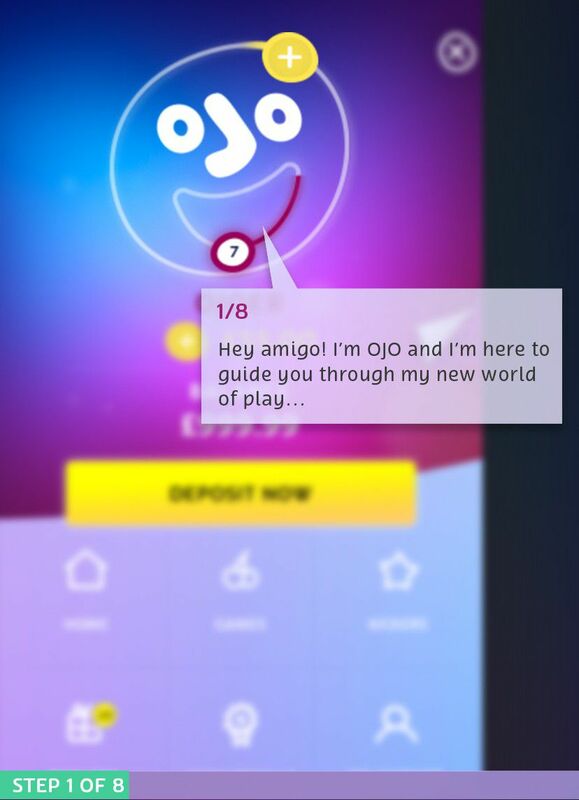 Every time you play, OJO will put some free money in your OJOplus account. It's there for you to collect or play at anytime, no strings. You can find out more on OJOplus right here. You can view your OJOplus balance on the homepage, next to the OJO+ icon in yellow. Anytime you want. All you need to do is click the 'COLLECT' tab and your OJOplus cash will be moved to your Real Money Balance. Withdraw it or play it, it's up to you! Well basically, there are 3 OJOplus categories, each indicated with 1,2 or 3 OJO+ icons. One yellow OJO+ icon indicates the lowest level of return while three yellow OJO+ icons indicate the highest level of return. So, placing a bet on a game with three OJO+ icons will earn you more in OJOplus cash than placing the same bet on a game with one OJO+ icon. You can view a full breakdown of OJOplus payouts on the OJOplus page here. What deposit/withdrawal methods does OJO offer? As part of OJO's security procedure, you may need to provide standard verification documents on the first withdrawal request, after that it's smooth sailing. If OJO needs any more docs from you then we'll ping you an email to request the documents. We aim to process your withdrawal request in a few hours, providing we have all the information we need. We process all withdrawals within 24-hours. 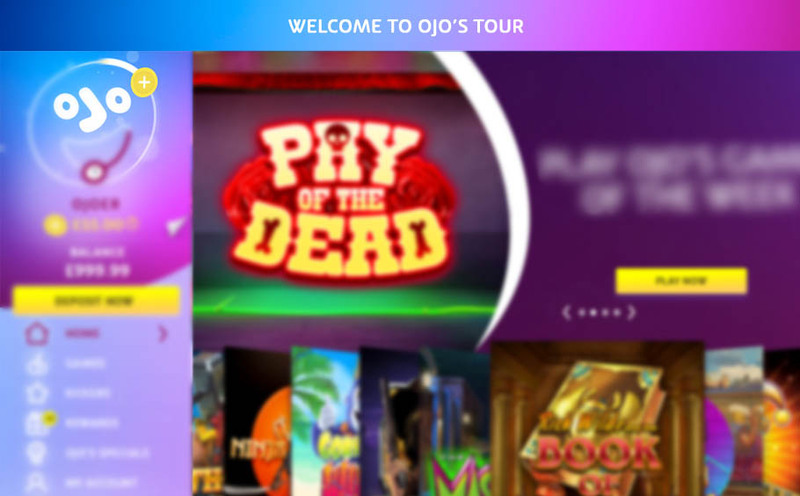 When you're playing one of OJO's great games, you'll see a Quick Deposit feature in the left-hand sidebar of the page (desktop only). If you've previously deposited using credit/debit card, you can use the Quick Deposit feature to swiftly deposit without going through any hassle, or without leaving the game! You only need to enter the card's CVC number and the amount you wish to deposit. BOOM! It's easy, peasy, OJO squeezy. The minimum deposit and withdrawal amounts depend on the type of payment method you're using. The minimum deposit is £10 while the minimum withdrawal amount is £20. You can view the full breakdown of the deposit and withdrawal requirements on the Banking page here. You sure can! You can use whatever payment method you want. We aim to send funds back to the payment method used for deposit. In some cases, this is not always possible (usually with pre-paid cards), which means we’ll send your funds to another payment option. Oops. OJO may not know the reason why your deposit was declined, it could be a question for your bank. If your debit/credit card was declined, then why not try one of the trusty eWallets like PayPal or Skrill? Take a look at OJO's Banking page here for more info. Hmm… It may be because we don’t have all the required documents or it could be something to do with your payment provider. Get in touch with the crew about this and we'll look into this ASAP-fast. A Deposit Confirmation Form (DCF) is common practice in the industry. It's for security purposes to confirm the deposits made and for further account verification, just a few personal details needed. No biggie! OJO doesn’t like wagering requirements. OJO believes your winnings should be yours to keep. It's just real money and real play. No strings. Booooorrriinng. Don't worry, you'll rarely need to do this. Head over to 'My Account' and select 'Upload Documents'. Here you can swiftly and securely upload docs, all the doc requirements are there too. It's important to keep your play fun. When the fun stops, stop. If you are playing with money meant for other things like bills or rent, or end up chasing losses then you may have a gambling addiction. 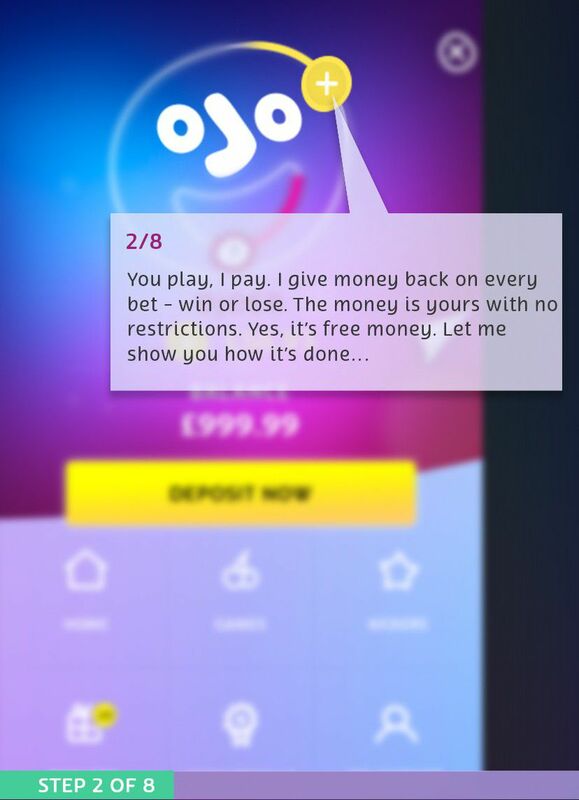 You can find out more by reading OJO's Responsible Gaming page here. I think I have a gambling problem? What should I do? If you believe that you have a gambling problem, you should restrict yourself from playing immediately. OJO has plenty of limitation options to put stops to your play. You can take a look at OJO's Responsible Gaming page here. Just head over to the 'OJO Safeguard' section under 'My Account'. Here you can set yourself a Cooling-Off period of 1, 2 or 7 days. This will apply account limitations and restrict you from making bets and deposits. Once the selected period is over, your account will automatically become active. Have a read of OJO's Responsible Gaming page here for more info. Just head over to the 'OJO Safeguard' section under 'My Account'. Here you can set yourself a Temporary Suspension period of 1, 2 or 3 months. This will apply account limitations and restrict you from making bets and deposits. Once the selected period of over, your account will automatically become active. Have a read of OJO's Responsible Gaming page here for more info. Head over to the 'OJO Safeguard' section under 'My Account'. Here you can set a Self-Exclusion period. This will restrict ALL your accounts under the same license and prevent you from opening further accounts. The minimum Self-Exclusion period is 6 months - you will not be able to play during that time. Once the Self-Exclusion period is over, your account will NOT automatically activate. You will need to call the OJO crew and request that your account restrictions are lifted. Take a look at OJO's Responsible Gaming page here for more info. Of course! Just mosey on over to the 'OJO Safeguard' section under 'My Account'. Here you have a choice of daily, weekly or monthly deposit limits. You can increase or decrease your deposit limits whenever you want. A Kicker is OJO's special perks that give OJOers more play. OJO will give your play a kick every day with Free Spins, Bonuses, exclusive promos, free prizes and rewards for gameplay challenges. OJO's always giving players a kick in the fun direction! You can keep track of your Kickers in the Kickers section on the left-hand sidebar of OJO's homepage. Here you'll find daily offers that are tailored just for you. Not sure what to play? Check out the days Kickers and grab a special deal. Remember, there are new Kickers every day, so keep checking back! Congrats on your Kicker! You're moments away from enjoying your treat. *high-five* Just head over to the Kickers section and you can claim it from there, either for free or by making a deposit. You can claim all your Deposit Kickers from the Kickers section. A Coupon Code is kind of like a key, you need it to unlock a special treat that's just for you. If you have a Coupon Code, head over to 'My Account' and click 'Coupons', here you can enter the code and release your bonus treat! Hmm, if you made a deposit and input a Kicker Code that didn't work, you need to get in touch with the OJO crew so we can check if the code is valid. If there's a code glitch going around, we'll credit the Kicker manually. But make sure you get in contact BEFORE playing, otherwise it could be considered a Free Reward and a max winnings limit of £100 or double the Reward amount will apply. If it's a Free Spins package, then it'll be limited to double the Free Spins value. 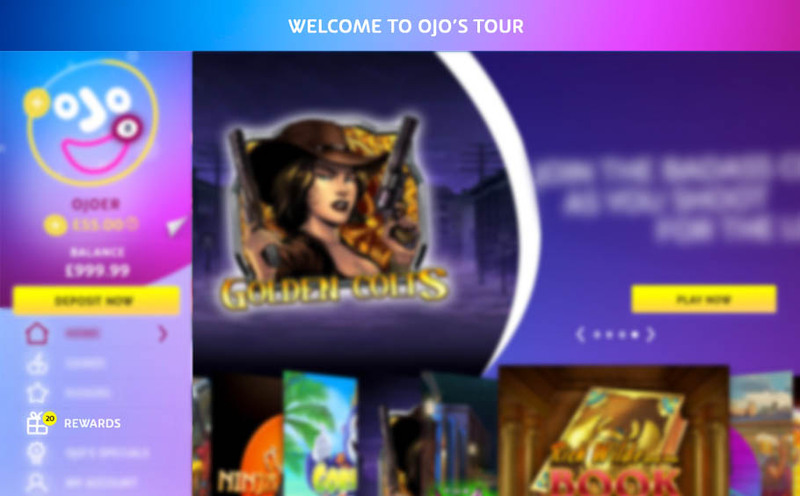 OJO likes to dish out Free Spins as a treat to OJOers when they deposit or just out of goodwill. This is a free bet where you get to spin a slot game without touching your balance. OJO NEVER attaches wagering requirements on Spins, this means anything you win is paid in cash and yours to keep, no funny business. I like to mix things up and offer Free Spins on different games with different values, so check the details! Remember, Free Spins expire after 24-hours - so make sure you play them! 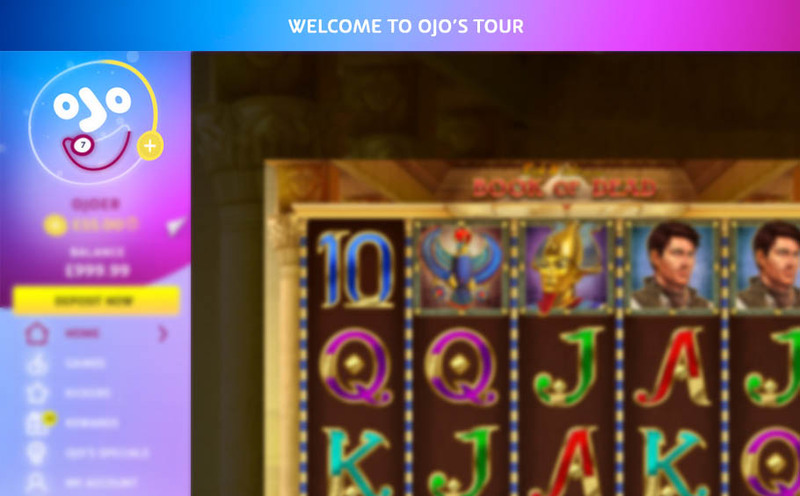 OJO offers three types of Free Spins, each with a different play value. 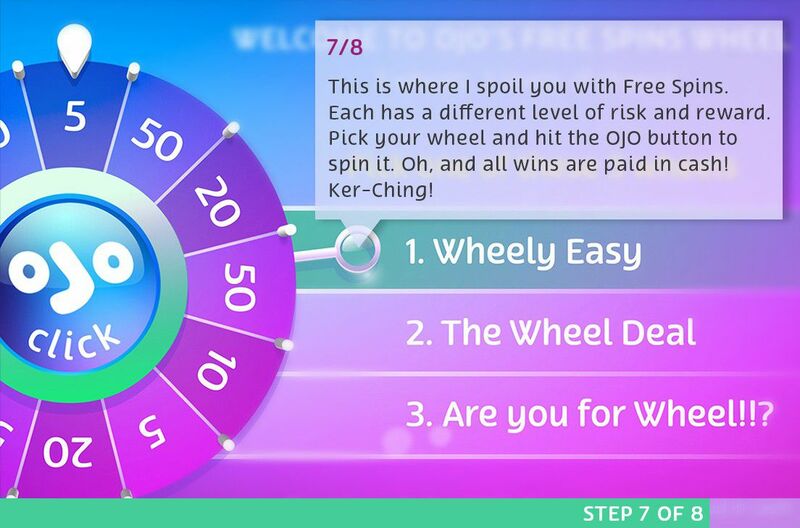 The OJO Wheel is OJO's way of saying you're awesome, that's why OJO fixes you up with a spin on The Wheel every time you reach a certain level, or maybe he'll treat you to one anyway. 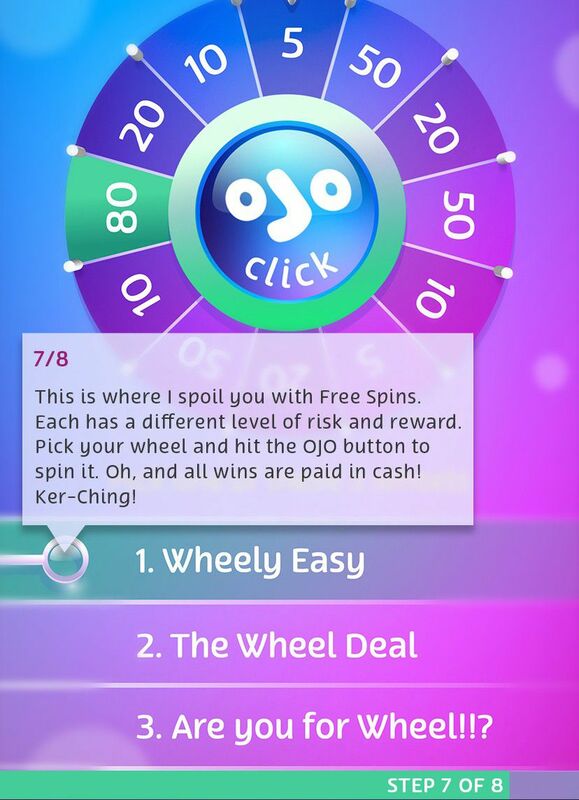 There's heaps of Free Spins to win on The OJO Wheel. You can find out more on The OJO Wheel here. 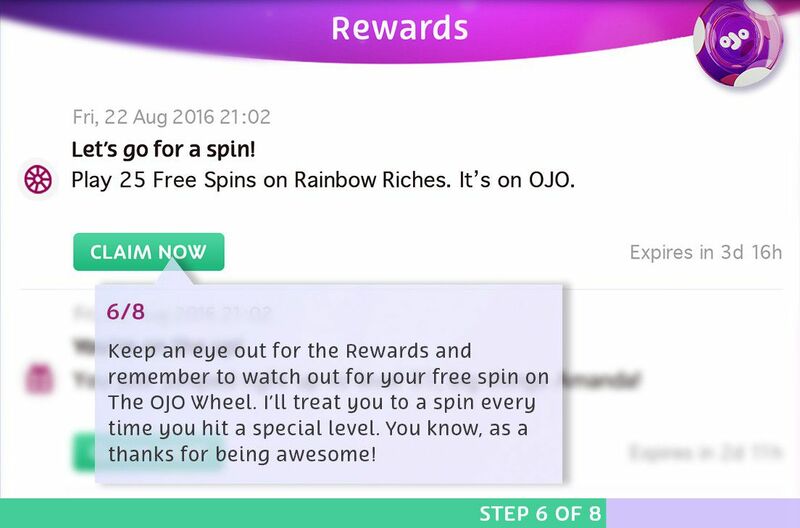 OJO will let you know when you have a spin on The Wheel, so keep an eye out for a message that'll appear on your screen. 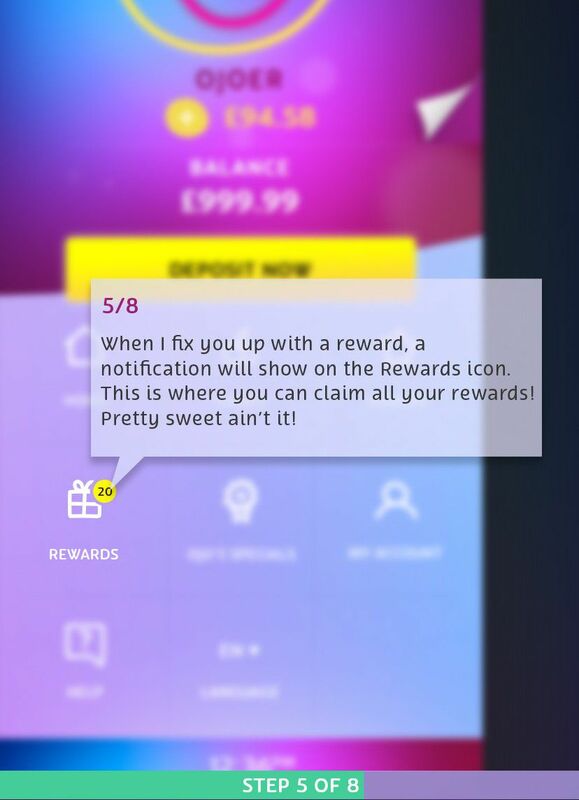 OJO will also give you a heads up in the Rewards section. The Free Spins prizes are based on your OJO Level, the higher the level you are, the higher the Free Spins value on The Wheel. You could win more Free Spins if you play The Wheel with a higher risk. #areyouforwheel!!? Each wheel has a different number of Free Spins up for grabs. Wheely Easy offers the lowest Free Spins prize as you're guaranteed to win. The Wheel Deal offers bigger prizes but you could land on an OJO-skull...dun-dun-duuun Are you for Wheel!!? has the BIGGEST prizes, but there's more skulls, which means more chance of landing diddly-squat! Reel Spinoffs are slot tournaments where you receive spins on a selected slot game. Any wins from those spins will convert into points on a leaderboard. If you finish in a prize pool position, then you're a winner! My Reel Spinoffs run throughout the day and there’s Buy-ins and Freerolls! Head over to the Kickers section and you'll find OJO's Spinoffs right there. A Freeroll Reel Spinoff is a free to enter tournament. If you've made a deposit in the last 3 days, then you can join OJO's Freeroll Spinoffs. Just pick the Reel Spinoff you wish to enter and a pop-up will confirm how many Free Reel Spins you have and what slot game will play before the slot opens. OJO runs Freerolls during the day so don't forget to login and take part. Good luck! 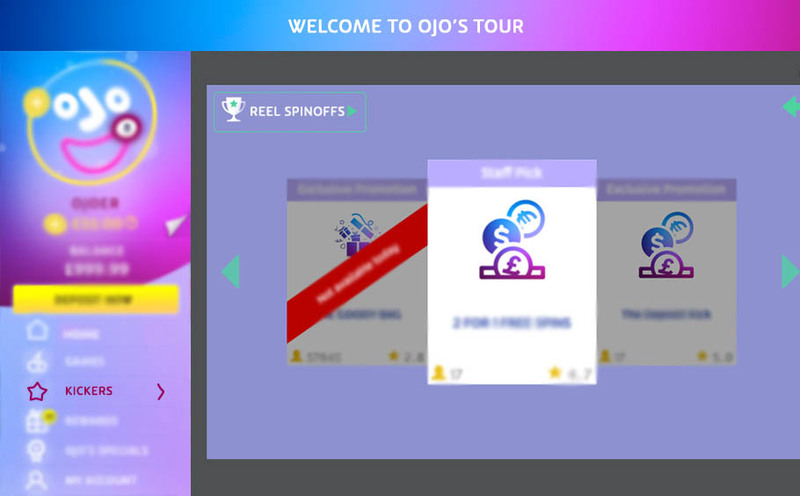 Click on the Reel Spinoff tournament you want to join and a page will open with different Reel Spins Packages, you pick the one you want by clicking the deposit button next to the package. This will take you to the deposit page with the Reel Spinoff Bonus Code already entered. Once you complete the deposit a pop-up will confirm how many Free Reel Spins you have and what slot game will play. Be lucky! You can check your rank in the Leaderboard section of the Reel Spinoffs. If you finish in the top 3 of the Freeroll Spinoffs, you'll win a nice OJO Free Spins Package. If you finish in the top 3 of the Buy-in Spinoffs, you'll win a Free Spins Package on top of any winnings you picked up with your reel spins. Any Reel Spinoff winnings will also show in the 'Rewards' section. OOAAAHHH! Want to give one of OJO's superfly slots 5 stars? When you're logged-in, you can rate a game by clicking on the stars in the top left of the game description. Simple! Want to find a certain game with 3 reels, an adventure theme and a BIG jackpot? OJO's got over 30 different game filters, so you can run detailed and accurate game searches. If OJO's got it, he'll dig it out so you can have slots of fun with it! Get it? Does super OJO safe answer the question? OJO's place is built with a serious internal security system that would keep a house fly at bay. OJO's entire gaming system and procedures are fully certified and in line with all necessary licensing conditions. And, OJO only works with the most trusted and established game providers. OJO is regulated by the Gambling Commission of Great Britain. This means OJO holds the highest standard of casino license. As a UK regulated casino, OJO abides by all laws and regulations, ensuring a trusted and fair gaming experience for all OJOers. You can view OJO's license status right here. Bit of a forgetty Betty eh? OJO doesn't keep a record of your password for security reasons. To reset your password, click on the ‘Forgot Password?’ link under the password box. You'll have to answer your secret question and then take note of the 4-digit code that appears. We'll then ping you an email with a link to enter the code and create your new password. Don't forget it! To take OJO on the go-go on your iOS devices, just download the OJO App from the Apple App Store. You can view more details on OJO's iOS App here. If you wish to download OJO's App on your Android device, you'll need to follow the instructions on the OJO Android App page here. Oh bummer. Sorry to hear you're experiencing pesky connection issues. Try pressing CTRL+ALT+DELETE at the same time and ending the PlayOJO task. This will close the browser and the game session. Don’t worry, the game session will resume and your funds and bonus rounds will still be there. Phew! Oh bummer! If the game has done a whoopsie then you'll need to contact the OJO crew and we'll terminate the session. You can view OJO's contact page here. You can update your deats by heading to the 'Personal Settings' section under 'My Account' and clicking 'Personal Information'. If you change your address or other important details, then you may need to verify your account again. Oh fiddlesticks! Hmm, well, they could have ended up in your junk folder, marked down as spam or they could have been blocked or maybe, you unsubscribed? Who knows! Check your email folders and if you can't find OJO's great emails, give the crew a shout and we'll subscribe you. Make sure you add PlayOJO.com to your email address list so you never miss out on OJO's great offers. You can see OJO's contact page right here. Every now and then you may come across an icon that you’re unsure of. Not to worry, you can find out what my shapes, shortcuts and icons mean right here. Pretty cool aren’t they! Just LOGIN and click on Live Chat for instant contact with my super support crew, they’ll have you all sorted in no time! Available from 06:00 till 00:00 GMT.